Внедрение CRM на базе "1С 8". 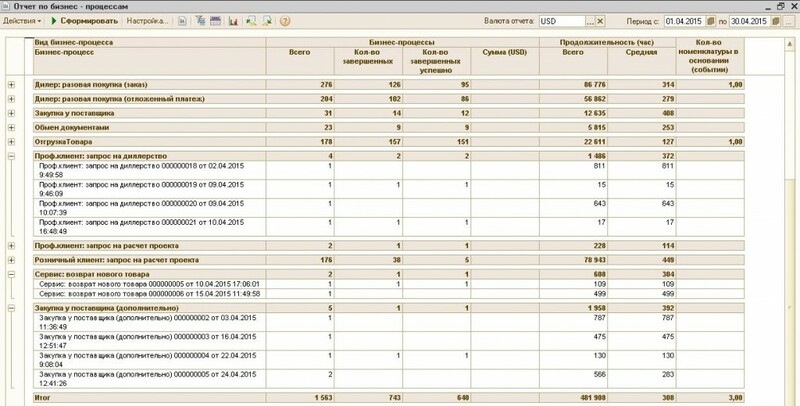 Построение бизнес-процессов. Organization of work of the company "from processes" (and not "from documents", as most companies work), which allows to restore order in the life of the company, to improve the quality of service, to exclude errors related to the human factor. Convenient and quick analysis of all company processes at any time: open / closed, at what stages are (so-called "sales funnel"), which allows you to make the right management decisions (what to do first, for example: spend on advertising, as there are few processes at the stage of contracting, etc.) Convenient visual representation of each process. Analyze all active tasks of the company with detailing to performers and units: monitoring the timing of their implementation, monitoring the fulfillment of the conditions of the tasks, the analysis of indicators. Managers' performance analysis : control the quality of tasks, control the timing of implementation, eliminate unsuccessful tasks. 1. Automation of individual accounting areas , such as "warehouse", "bank", "Mutual settlements", "Fixed assets, depreciation". 2. Consolidation of disparate data , integrated automation of accounting and management accounts. 3. Switch to a modern business automation platform - 1C 8. Organization of web access and other methods of remote access to databases. Differentiation of access rights at the record level in databases. 4. Organization of work "from processes" , in other words - the organization of the work of the business on tasks, both manual and automatically generated when the process is progressing according to the described business process scheme. Organization of work "From documents" - is 1, 2, 3 stages. Organization of work "From processes" - Stage 4. Our company has performed all of the above automation steps many times and to date we see that for the successful conduct of any business, it is necessary to automate business process schemes and organize work from processes / tasks under these schemes with control over the timing of each process /tasks. Without automation of business processes, the work of the offices looks like this: the office "boils" while the director or the head of the department in the office and there is a stream of incoming calls that need to be reacted. By the way, automation of call accounting is a separate issue, which is an integral part of business process automation. 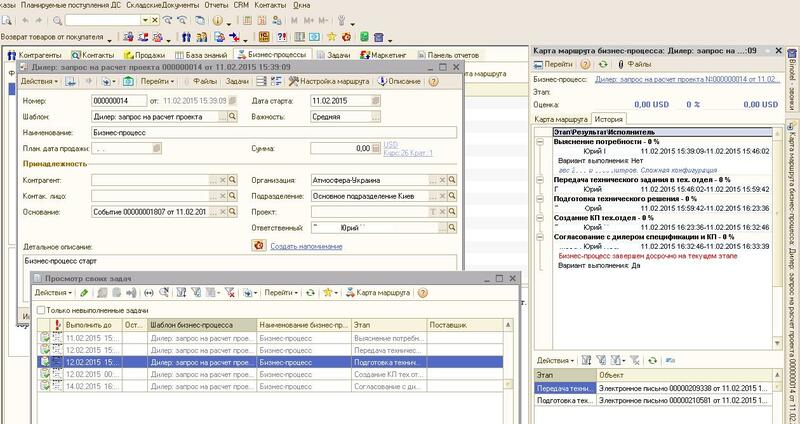 Automation of business processes can be performed on the configuration functionality «CRM» от rarus.ru or on the basis of any typical configuration of "1C 8". Fig. 2. 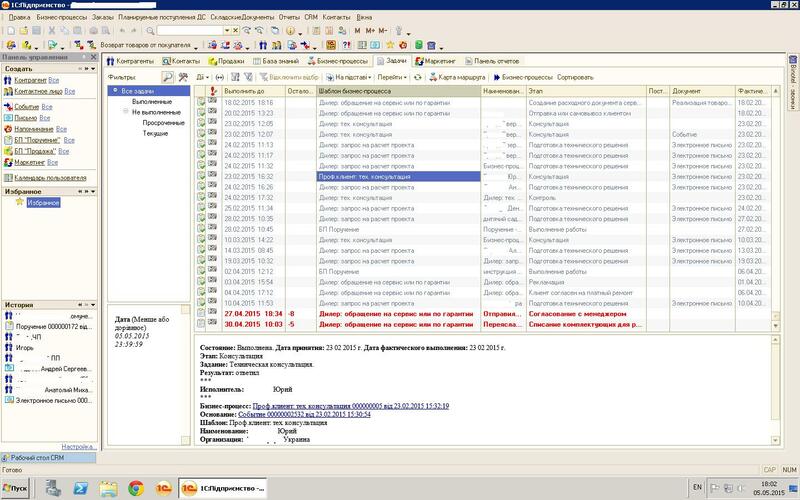 The main desktop "CRM", opened on the tab "Tasks". the main panel with data on counterparts, contacts, sales, knowledge base, business processes, tasks, marketing activities, reports. The main panel of the desktop is open on the "Task" tab, where the user sees his tasks, their status, the execution phase, the execution time. The lower part of Fig. 3 shows detailed information on the current task. Fig. 3. 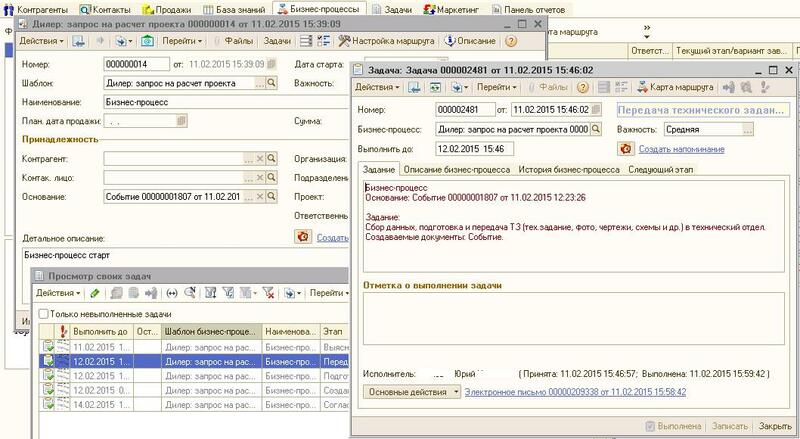 The main desktop "CRM", opened on the tab "Business Processes". Fig. 4. An open form of the business process, at the bottom of the list of tasks for this business process, on the right is the business process route map. Fig.5. The form of setting the business process route for the current business process. performers - a user with the role of "Technical Specialist". Fig. 6. History of events for the current business process. 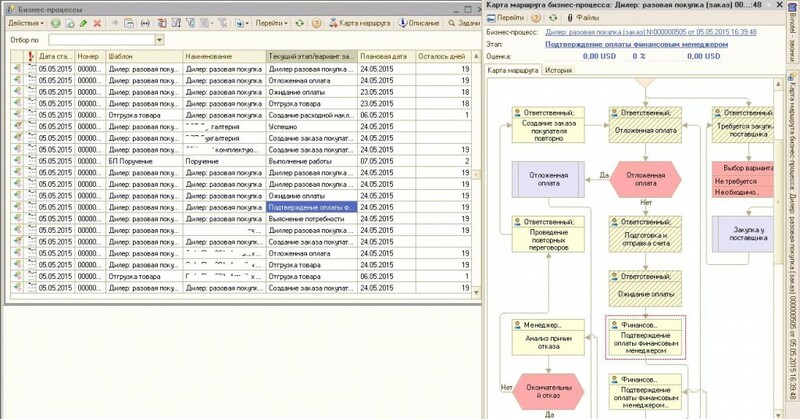 Below, in the center - the list of tasks for the current business process. Fig. 7. 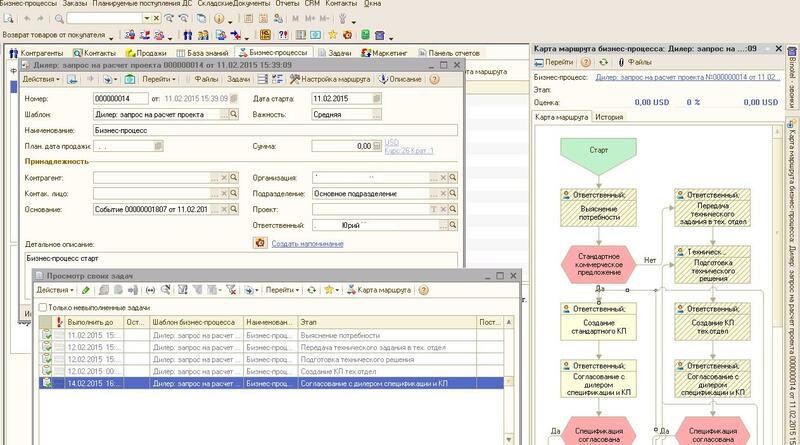 The form of one of the tasks for the business process on the tab with the task description. the ability to open a route map (the "Route Map" button, an example in Figure 4). Fig. 8. The "Task Analysis" report. 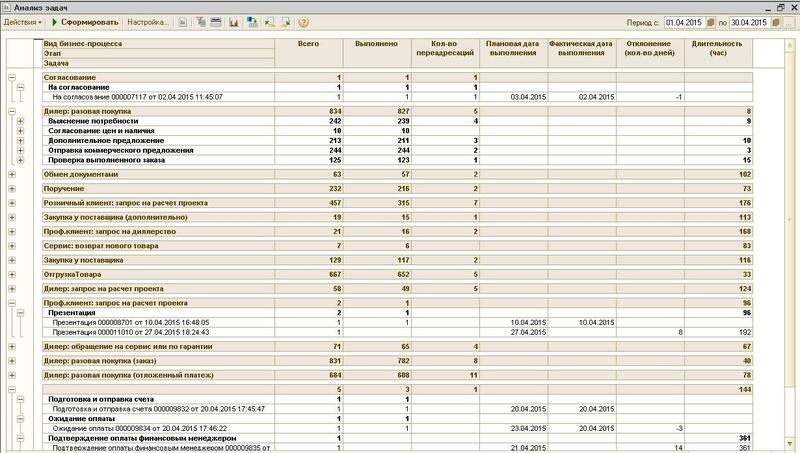 In this figure, it is a report on the own tasks for the current user, since he has a selection at the record level, that is, the user sees his tasks, sees the tasks for his counterparties, his organizations, units and cash desks. A user with full rights can see the status of tasks for all organizations, with the necessary groupings, which gives a general understanding of existing processes and their stages at all organizations. Fig. 9. Report on business processes. In Fig. 9. a business process report is presented, which provides information for the current user about their processes and their status: completed / not completed, duration of execution. A user with full rights will see the status of business processes of all organizations, users and counterparties. Fig. 10. Journal of Business Processes. On the right is the route map of the current business process. In Fig. 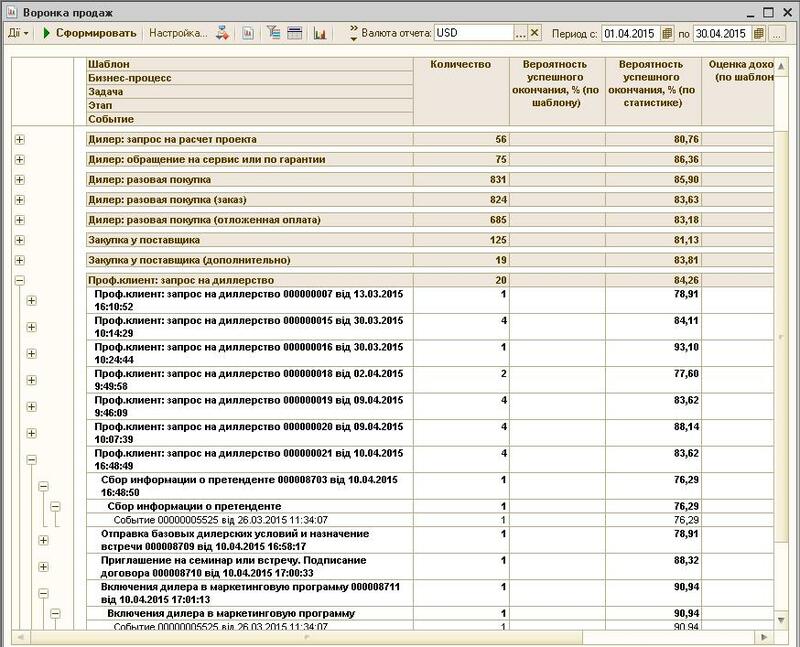 10 the cursor in the business process log is set on the business process "Dealer-single purchase" with the current stage "Confirmation of payment by the financial manager". On the right side of the business process map is a graphical representation of the business process, where the current stage "Payment confirmation by the financial manager" is highlighted in red-dotted frames. Fig. 11. The sales funnel report. The "Sales Funnel" report is a key goal of building business processes (Figure 11). The sales funnel allows you to see the status of all the enterprise processes, their number, the percentage of completion. The report provides information that is useful for deciding on processes that need to focus managers. 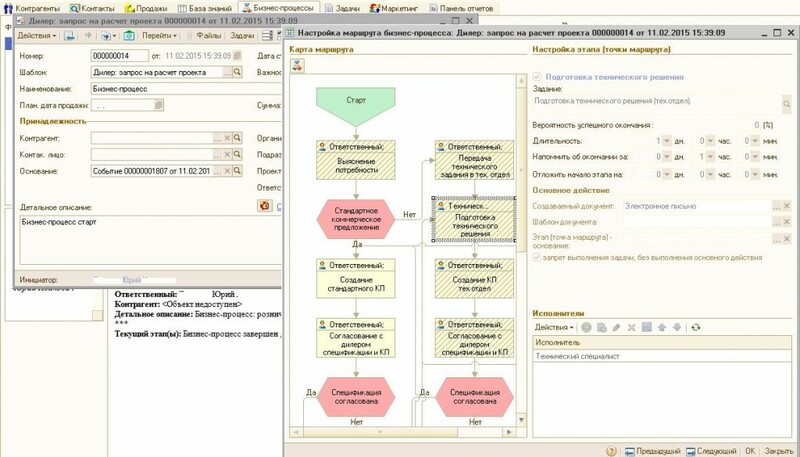 Another goal of implementing business processes is the organization of the work of "processes" , as described at the beginning of this article. The introduction of business processes allows you to assess the state of ongoing processes in the enterprise from different angles in order to make informed decisions regarding the allocation of funds, marketing activities, employees, and others.. This article presents an example of implementing business processes - this is just one of the stages when implementing CRM . Another stage is the organization of the presence in the information system of all contacts with counterparties - phone calls, correspondence by e-mail, SMS-informing. If you use IP telephony, you can configure automatic import of telephone calls from the virtual ATC (see: 1C 8: Integration with a virtual ATC "Binotel"). Concerning e-mail, its presence in the information base can be configured without much effort, since, in practice, all typical configurations have a built-in mail client. Business process "Cyclic formation of the document "Buyer's Order"
Business process "Calling potential counterparties"